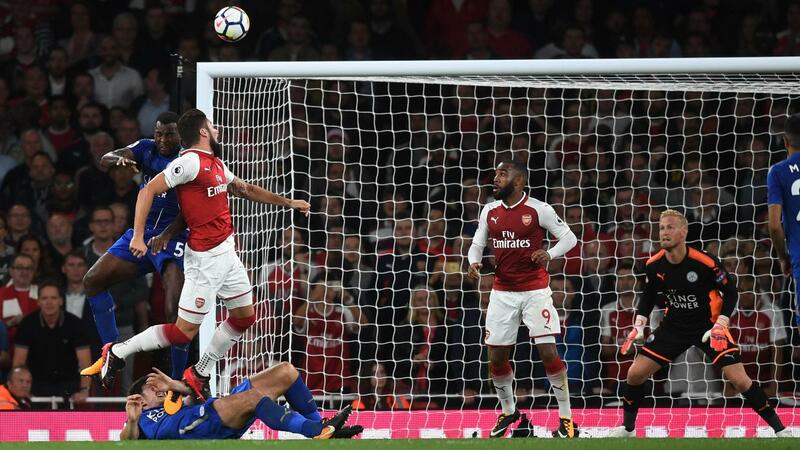 Olivier Giroud headed in a stoppage-time winner as Arsenal kicked off the season with a comeback win over Leicester City. 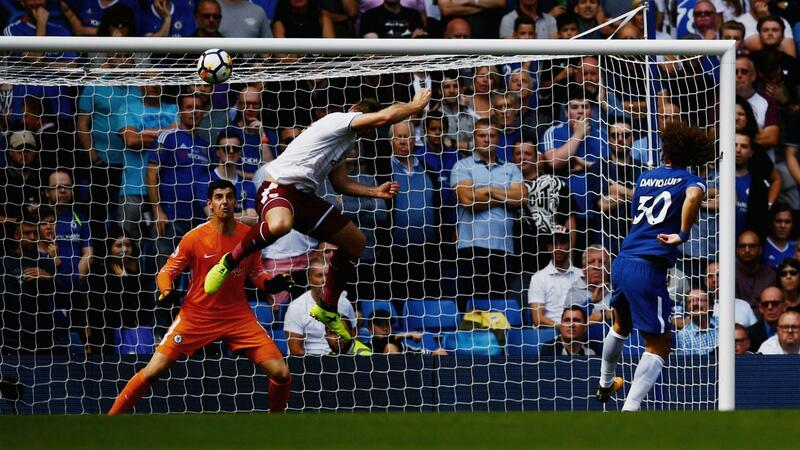 Defending champions Chelsea lost at home to Burnley after being 3-0 down at half-time with 10 men. 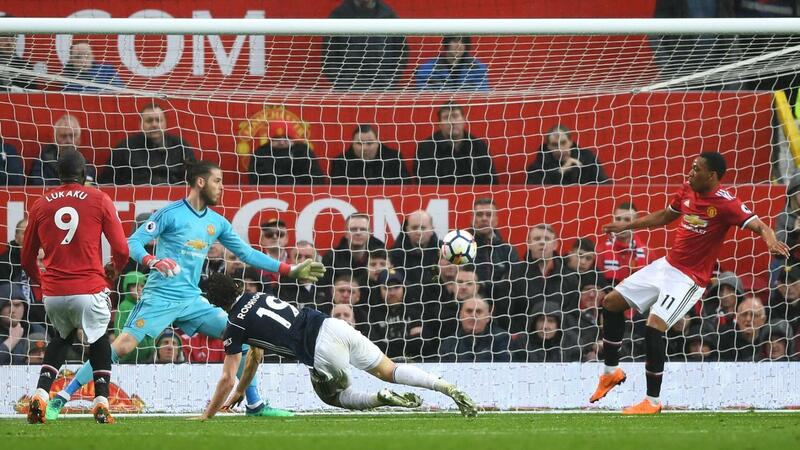 Paul Pogba scored a goal and set up another, while Henrikh Mkhitaryan provided two assists for the second successive match. Charlie Daniels scored the Carling Goal of the Month but Raheem Sterling hit a stoppage-time winner for Manchester City. 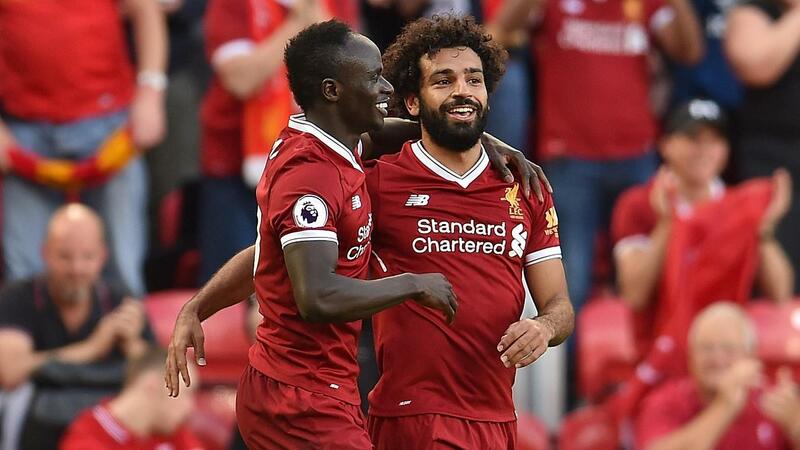 Roberto Firmino, Sadio Mane and Mohamed Salah were all on target, while Firmino and Salah also set up a goal each. 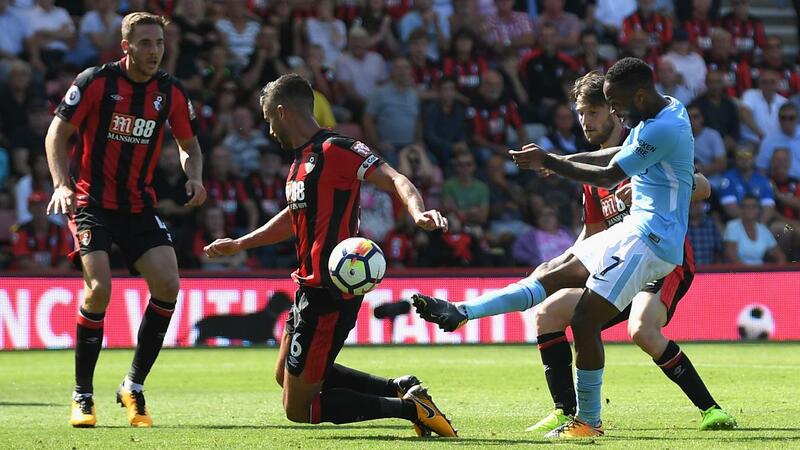 Man City took advantage of Sadio Mane’s first-half red card with Kevin De Bruyne setting up two of the five goals. 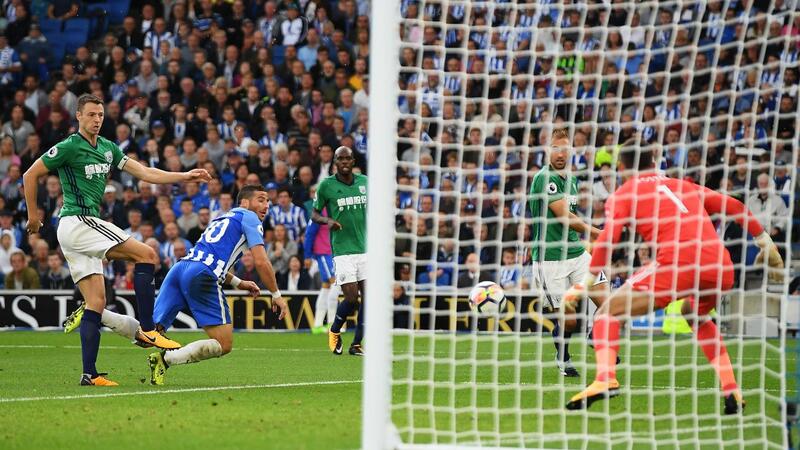 Pascal Gross struck twice and set up a goal for Tomer Hemed as Brighton secured their first PL victory. 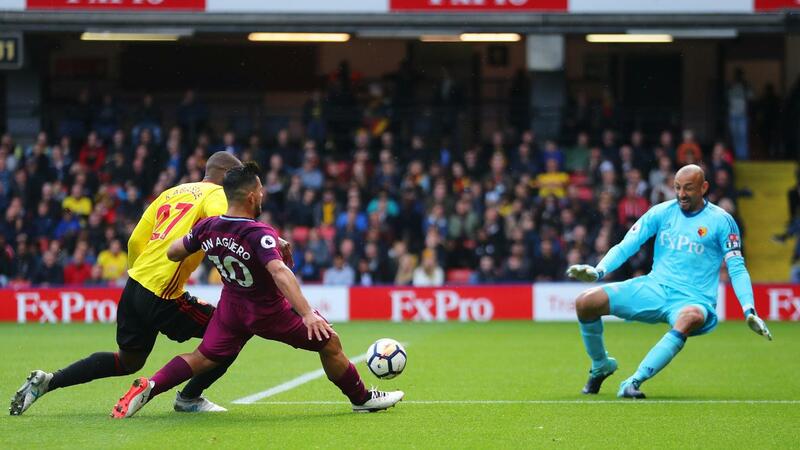 Sergio Aguero hit a hat-trick and laid on a goal for strike partner Gabriel Jesus in a commanding win at Watford. Harry Kane’s first-half brace helped Spurs to establish a 3-0 lead, but West Ham nearly grabbed a point. 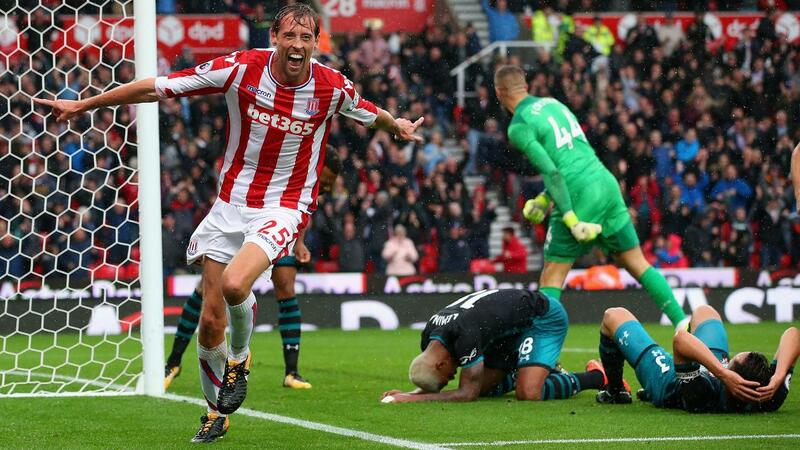 Peter Crouch's late winner earned the Potters their second league win of the season. 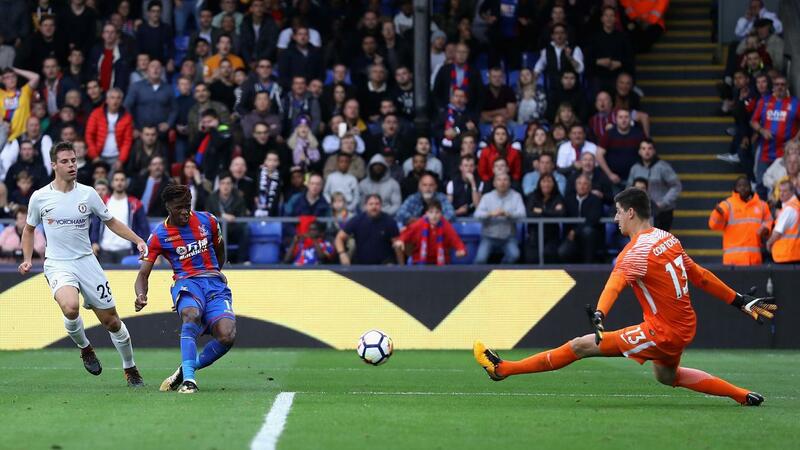 Wilfried Zaha struck the winner as Palace got their first goals and points of the campaign. 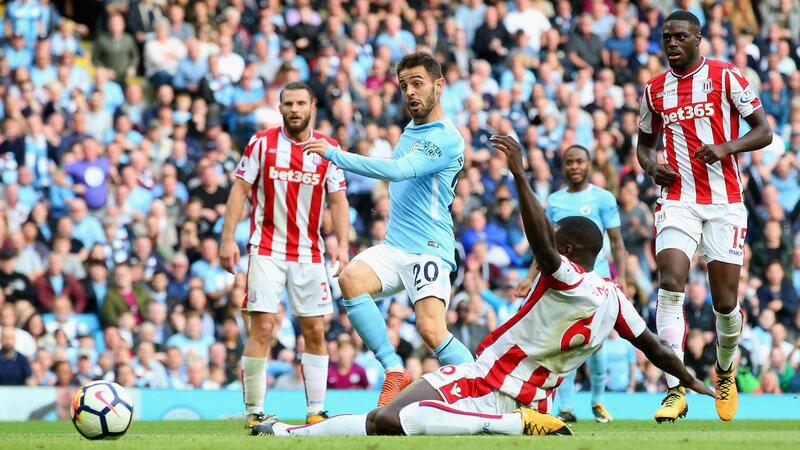 Manchester City had six different goalscorers and five different assist-makers as they put Stoke City to the sword. 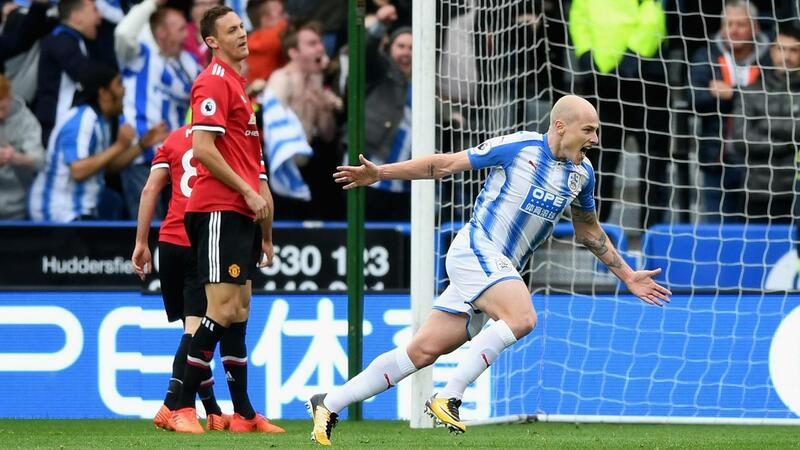 Aaron Mooy and Laurent Depoitre struck as promoted Huddersfield stunned Man Utd. Spurs scored twice in the opening 12 minutes and led 3-1 at the break as they beat Liverpool at Wembley Stadium. Anthony Martial struck a late winner for Manchester United in a tight match at Old Trafford. Alvaro Morata scored his first goal since September, his second-half header securing a home win for Chelsea. Shkodran Mustafi and Alexis Sanchez scored for Arsenal in the North London Derby. 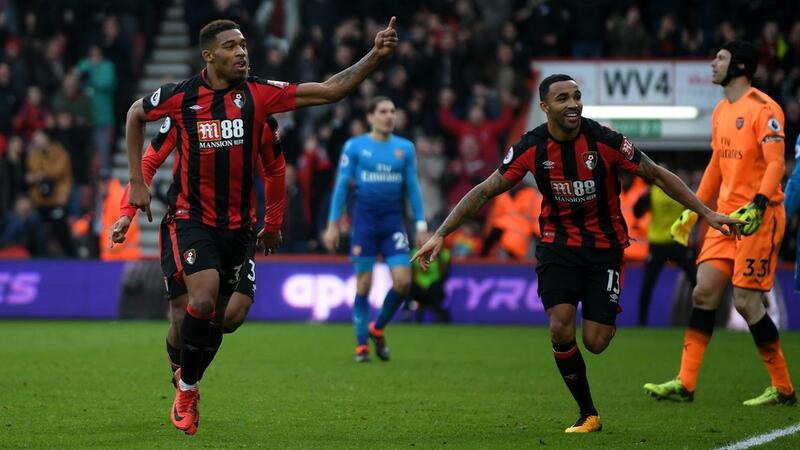 Callum Wilson netted a hat-trick in only his second PL start since a knee injury in February 2017. Raheem Sterling scored another late winner as Man City came from behind to triumph at Huddersfield. 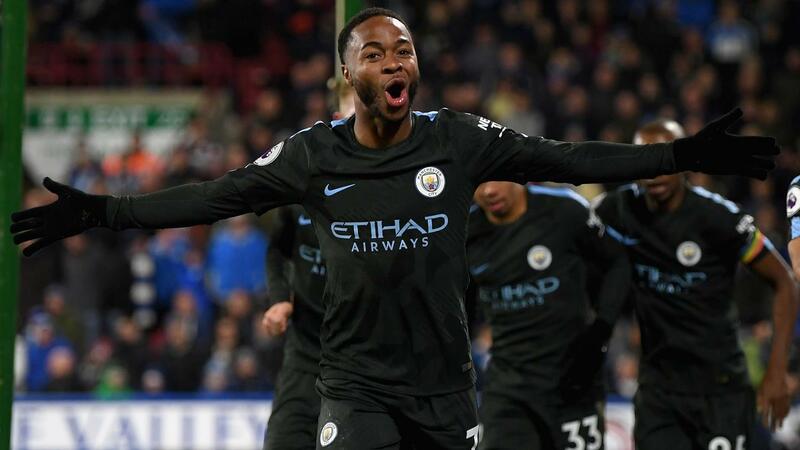 Raheem Sterling repeated the feat, this time on home turf, as his stoppage-time strike secured Man City’s 12th successive PL win. 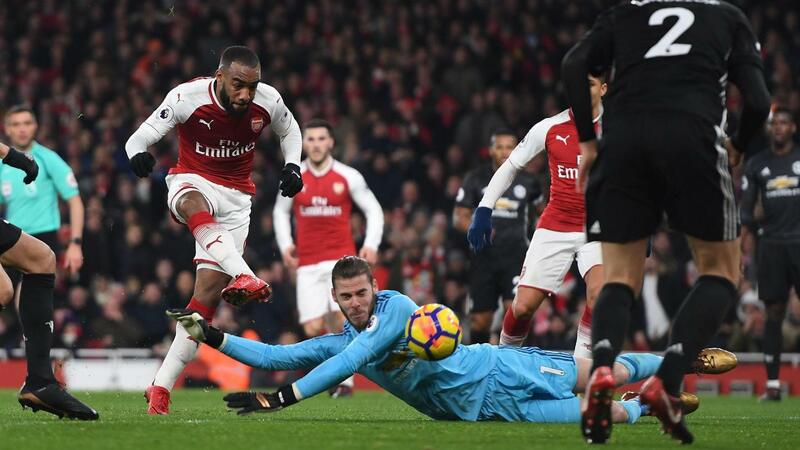 Antonio Valencia and Jesse Lingard struck inside the opening 11 minutes and David De Gea made a stunning double save as Man Utd won despite Paul Pogba’s dismissal. Marko Arnautovic fired home in the sixth minute as David Moyes earned his first win as West Ham manager. 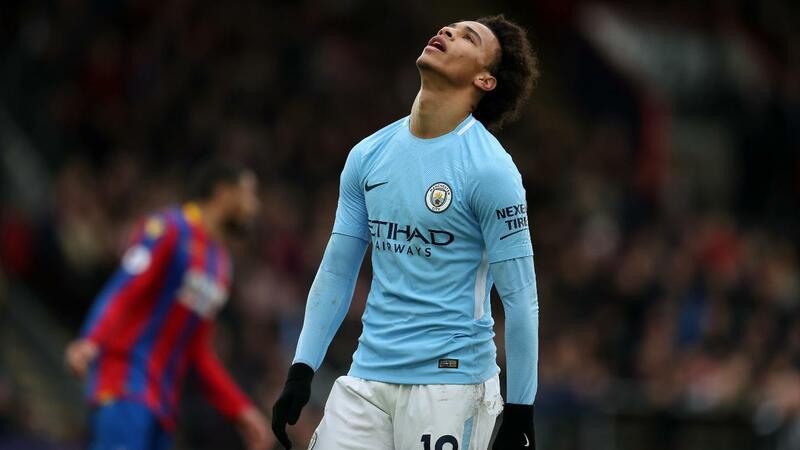 Manchester City won their derby duel and became the first PL team to win 14 consecutive matches in the same season, while moving 11 points clear at the top. 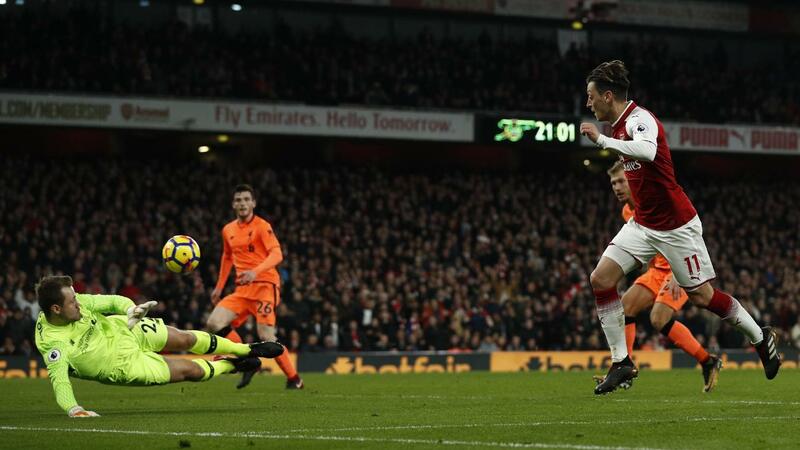 Arsenal fought back from 2-0 down to grab a share of the spoils in one of the matches of the season. Man City’s record-breaking 18-match PL winning run was ended by Crystal Palace, who had a late penalty saved. 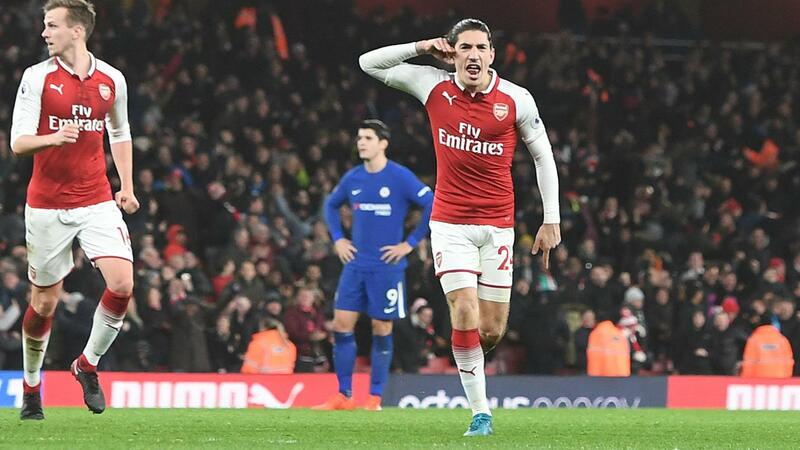 Hector Bellerin struck a stoppage-time equaliser in a match featuring 33 chances, with all four goals coming in the last half-hour. 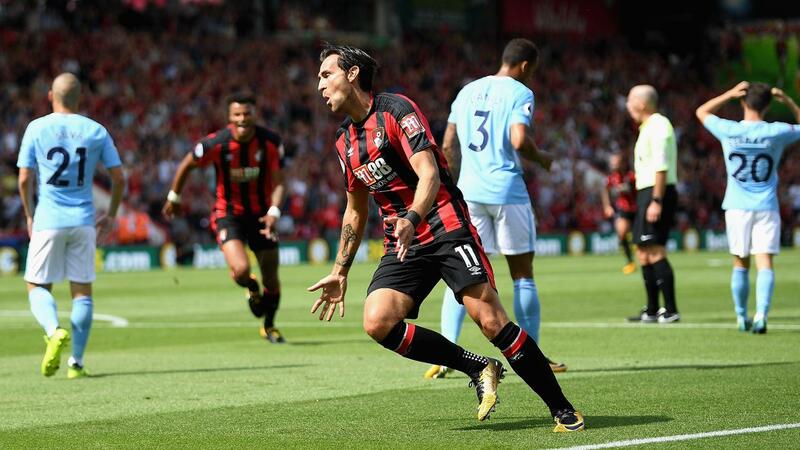 AFC Bournemouth won midway through a seven-match unbeaten run that earned Eddie Howe the Barclays Manager of the Month award. 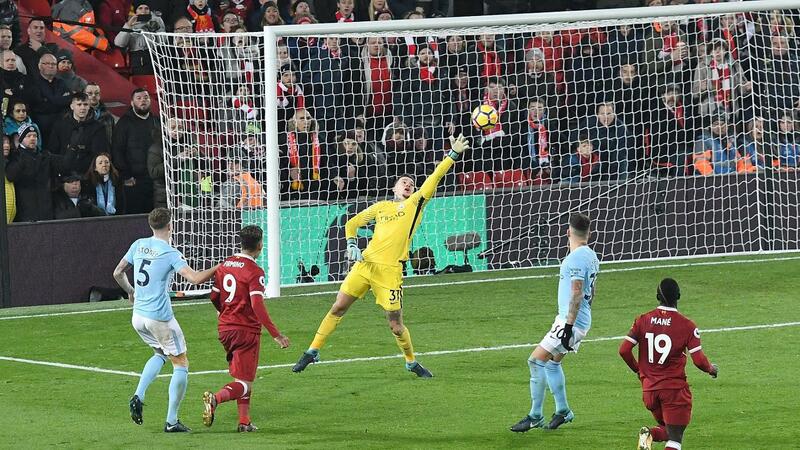 Liverpool scored three goals in nine minutes as Man City suffered their first defeat of the season, despite scoring twice late on. 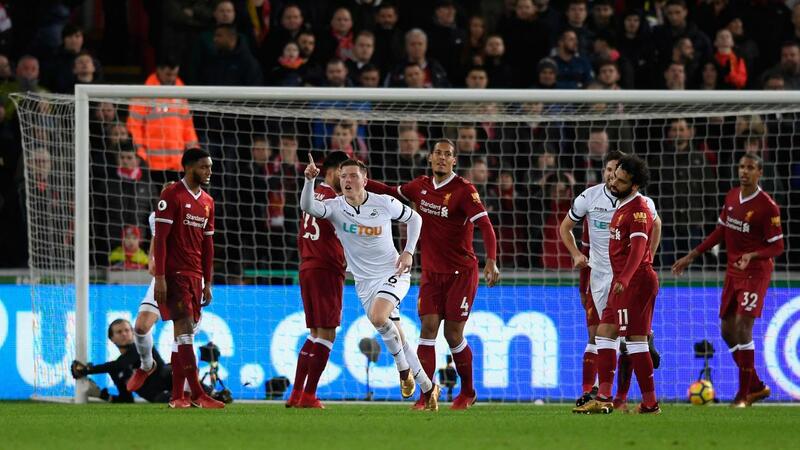 Alfie Mawson’s first-half strike was decisive, leading Swansea manager Carlos Carvalhal to compare Liverpool with a Formula 1 car stuck in traffic. 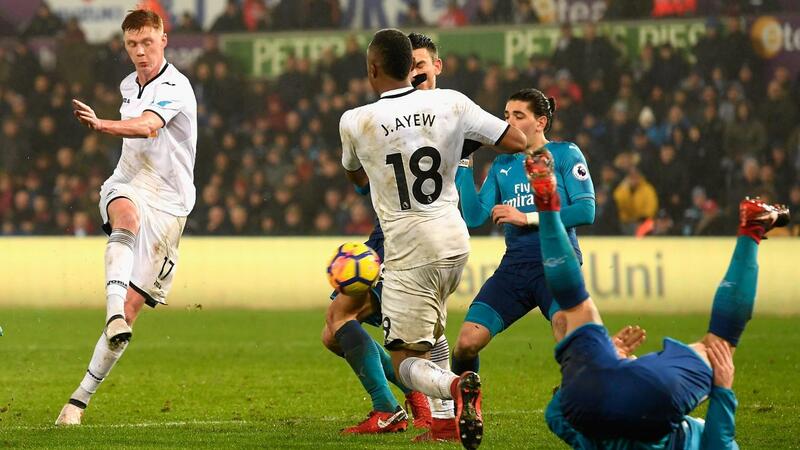 Swansea moved out of the relegation zone for the first time since November after surprising Arsenal. Christian Eriksen scored after 11 seconds, the joint third-fastest goal in PL history, as Spurs triumphed. 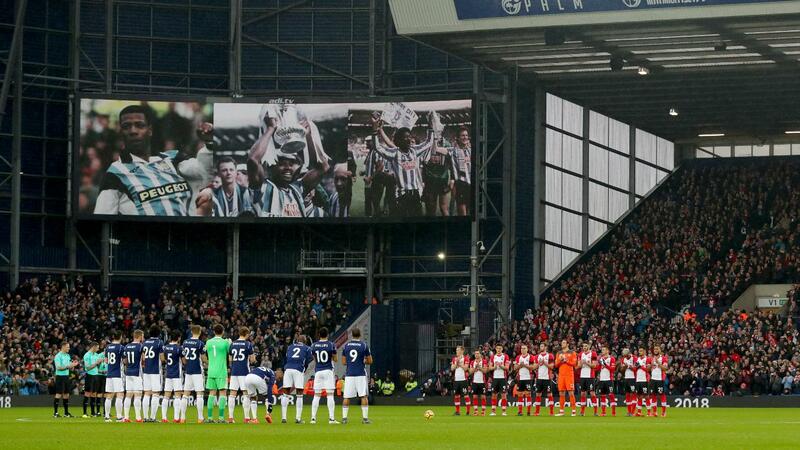 West Bromwich Albion paid their respects to Cyrille Regis and took an early lead, but Southampton fought back to win. 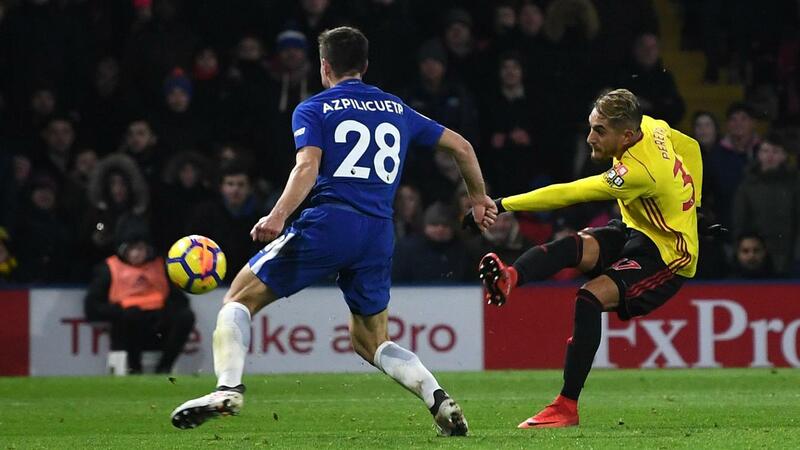 Three late goals secured an emphatic victory for Watford against 10-man Chelsea in Javi Gracia’s first home match in charge. Huddersfield halted a five-match losing streak in style, beating in-form AFC Bournemouth to climb out of the relegation zone. A Glenn Murray double briefly took Brighton & Hove Albion as high as 11th in the table. Man Utd battled back from two goals down, with Nemanja Matic hitting a long-range stoppage-time winner. 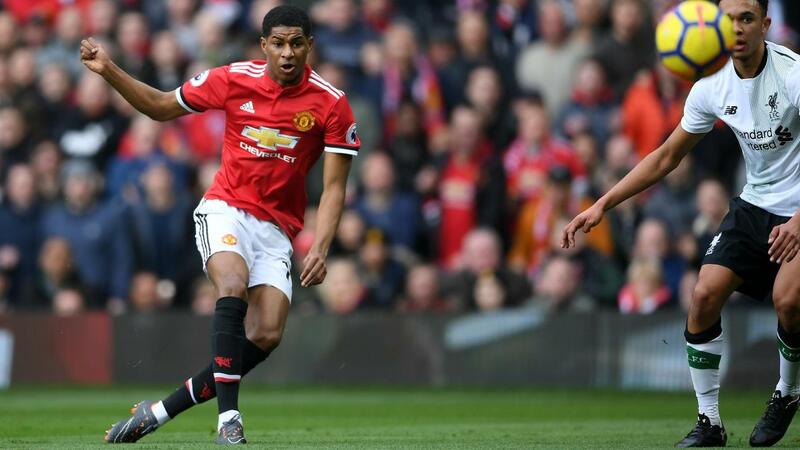 Marcus Rashford scored twice as Jose Mourinho’s second-placed side moved five points clear of their visitors. 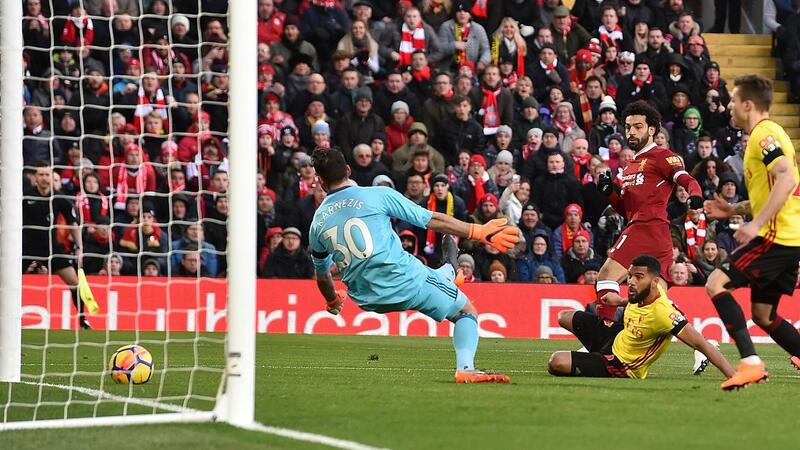 Mohamed Salah struck four times as Liverpool opened up a seven-point gap over fifth-placed Chelsea. 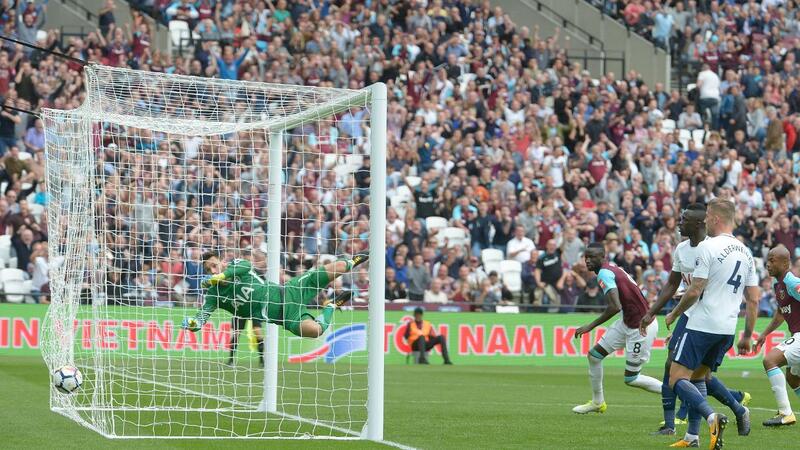 West Ham got three goals in the opening 17 minutes as David Moyes’s side won a crucial relegation match. Christian Eriksen's long-range strike and two Dele Alli goals gave Spurs their first win at Chelsea in 28 years. 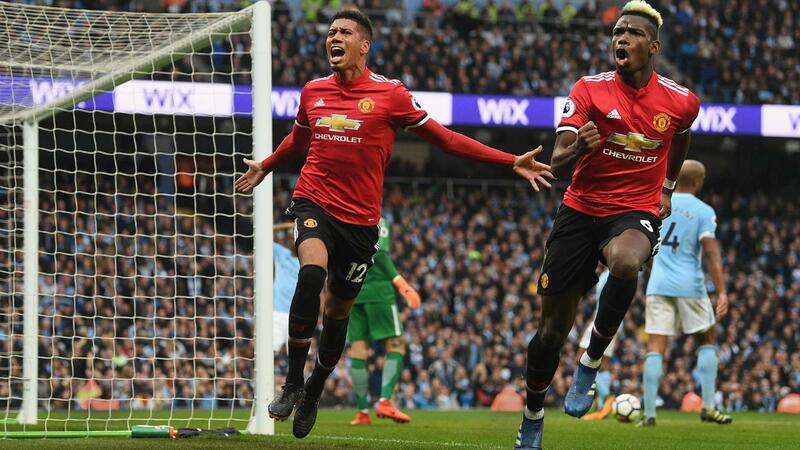 Man City looked set to claim the title against their city rivals after going 2-0 up, but Man Utd fought back to put the celebrations on hold. 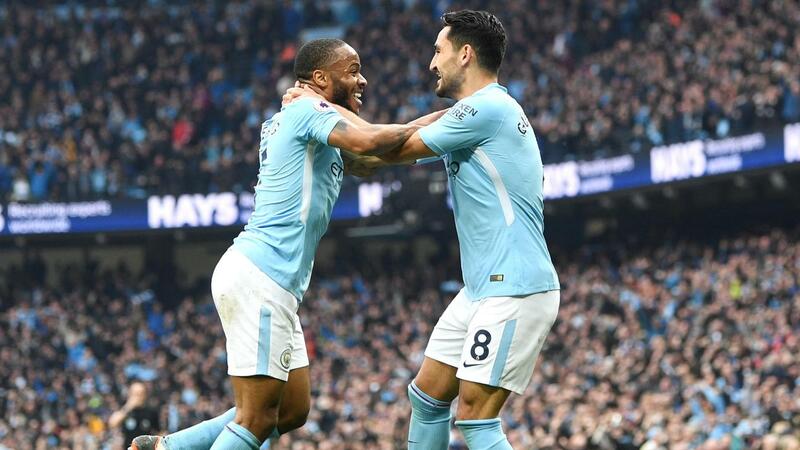 Man City responded well to their setback against Man Utd, with two quickfire goals midway through the first half again putting them on the brink of the title. Jay Rodriguez scored the decisive goal as the PL’s bottom side triumphed at Old Trafford and handed the Trophy to Manchester City. Burnley secured a fifth successive win in a run that earned Sean Dyche March’s Barclays Manager of the Month award. 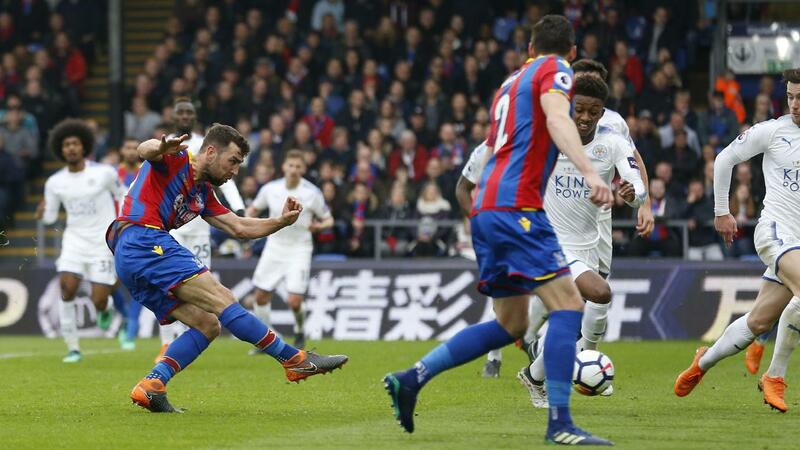 Five different players scored as Roy Hodgson’s Crystal Palace all but secured their PL status against 10-man Leicester City. 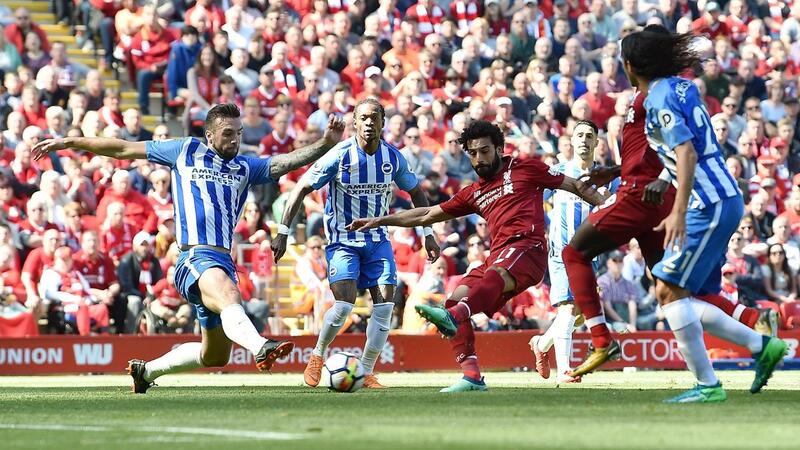 Pascal Gross’s second-half header ensured safety for Brighton with two matches to spare. 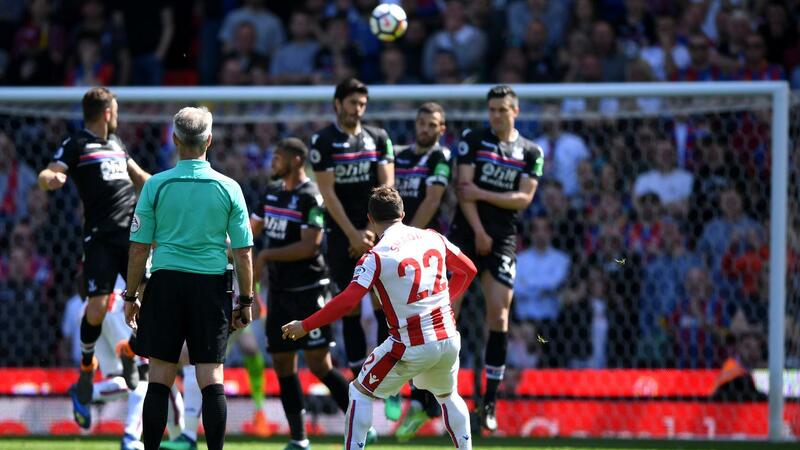 Stoke’s Xherdan Shaqiri scored a first-half free-kick but Crystal Palace’s comeback ended the Potters’ 10-year stay in the top flight. 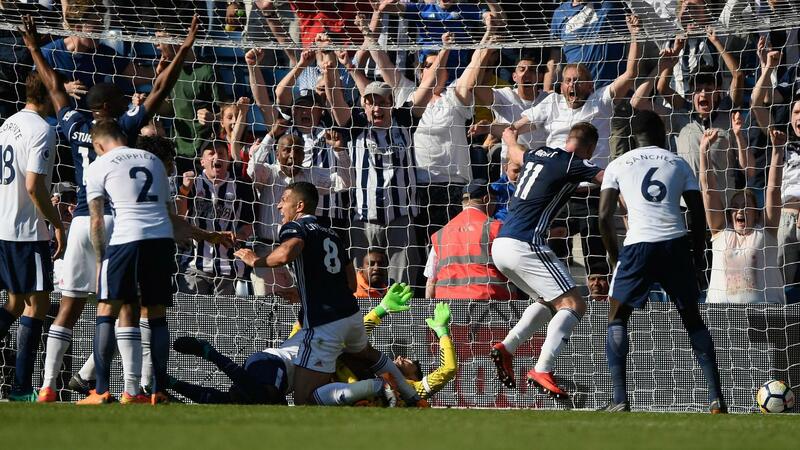 Jake Livermore's stoppage-time winner extended Darren Moore’s unbeaten run as manager to five matches and delayed West Brom’s relegation. 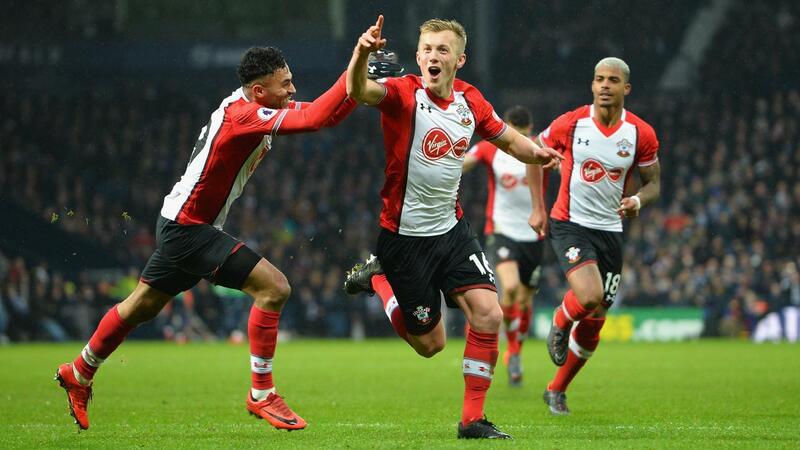 Substitute Manolo Gabbiadini struck the winner, relegating West Brom and securing Southampton’s safety at Swansea’s expense. Man City were presented with the PL Trophy after a goalless draw with Huddersfield, who picked up a valuable point in their battle to avoid the drop. Another draw at a top-six side secured Huddersfield’s PL status, meaning all three promoted teams stayed up. 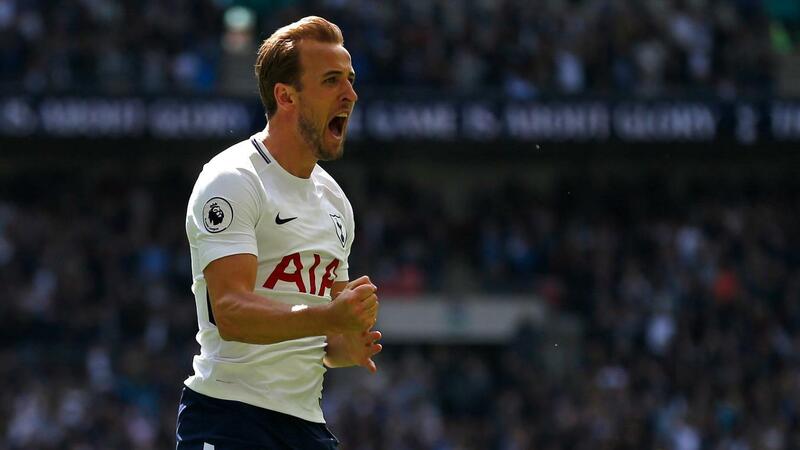 Harry Kane scored twice to push Mohamed Salah close for the Golden Boot, while Erik Lamela and Jamie Vardy also struck braces in a pulsating match. 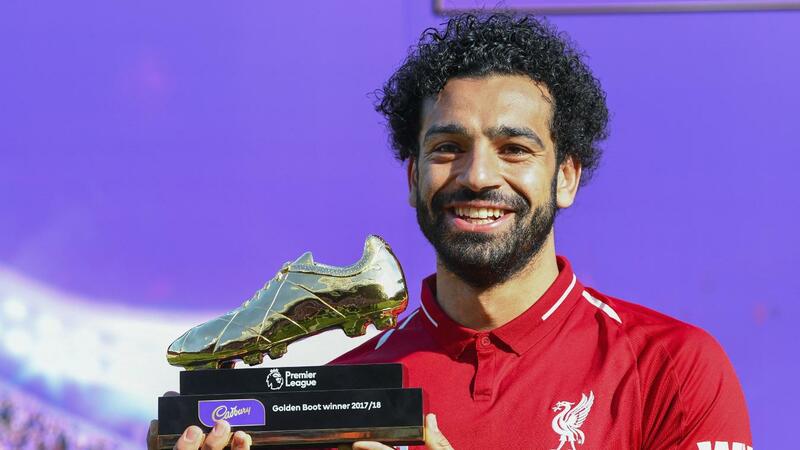 Mohamed Salah opened the scoring and finished two goals ahead of Harry Kane in the fight for the Golden Boot, while Liverpool secured fourth place. 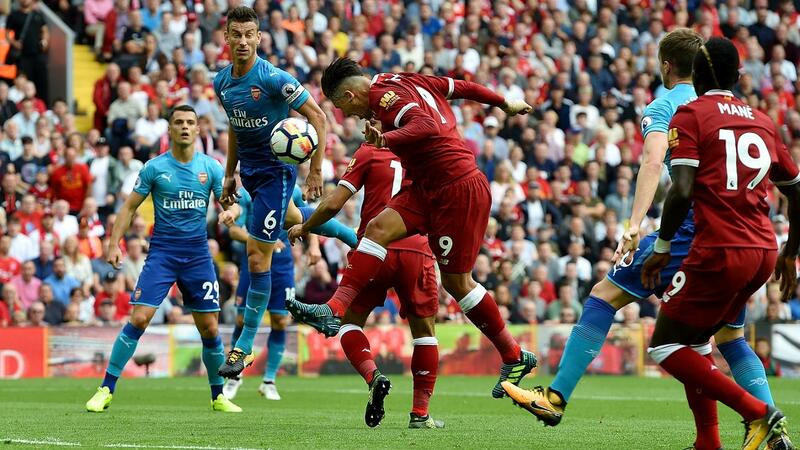 Arsene Wenger’s 22-year reign at Arsenal ended with a win after Pierre-Emerick Aubameyang’s fourth goal in three matches. 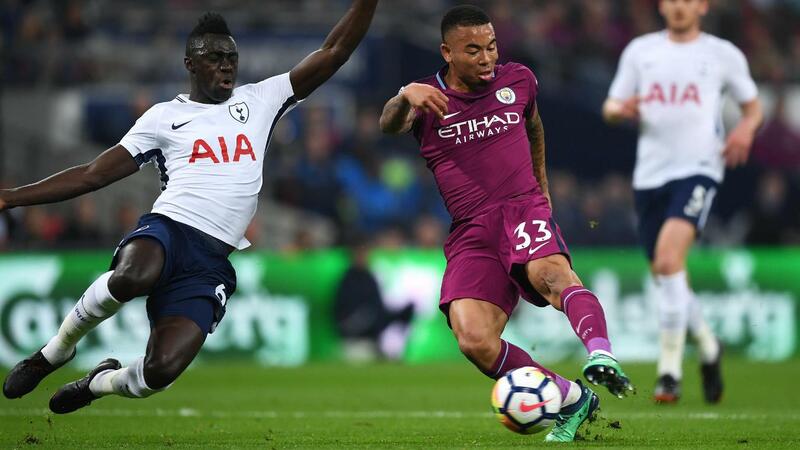 Gabriel Jesus’ stoppage-time winner made Man City the first team to reach 100 points, while Kevin De Bruyne’s assist made him the first winner of the PL Playmaker award.